It's amazing what food can do. While we all know that food gives us nourishment, it makes us happy, it satisfy our cravings and it relives wonderful memories... and it re-connects old friends too! Such is the case of a box of warm, moist chocolate chip cookies that were lovingly baked by my former grade school kabarkada Shami. Shami is a budding baker who can whip up a batch of really yummy cookies! It's your feel-good food. Take her cookies for instance, it was my yummy snack last Monday which I shared with my family over cups of coffee and a glass of cold milk for some. For your those are still on a look out for Christmas gift ideas, why not try Shami's Chocolate Chip Cookies. 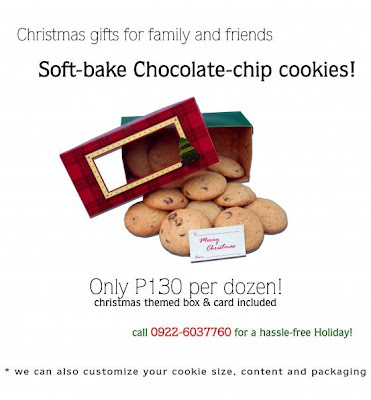 One box is only for P130 and it comes in a decorated box with gift card!